Summer lovin’ in a salad! 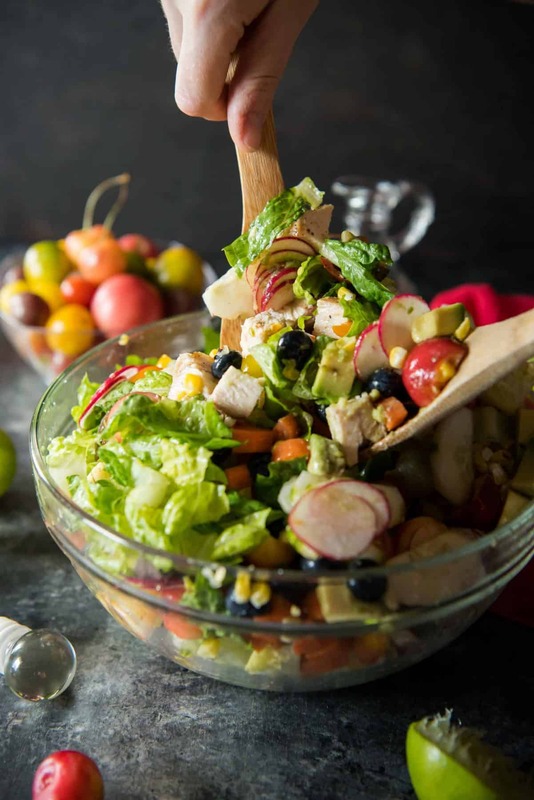 Grilled chicken, grilled corn, fresh cherries, blueberries, and avocado are tossed with standard salad fare and a tangy lime vinaigrette – creating a crunchy Summer Chopped Salad that’s perfect for any meal! I stopped at World Market yesterday…and the pumpkin-flavored stuff was prominently displayed at the front door. Pumpkin pannetone, pumpkin lace cookies, pumpkin ginger snaps. My soul is laughing and crying simultaneously because, for the first time in a long time, I’ve actually thoroughly enjoyed this summer. The weather, the food, the vibe. All of it. Of course, you know me. Fall and anything pumpkin are my jam, so I’m sure the sadness will subside once I light my first B&BW Leaves candle (<–aff link.) Which will likely happen this weekend, come to think of it. 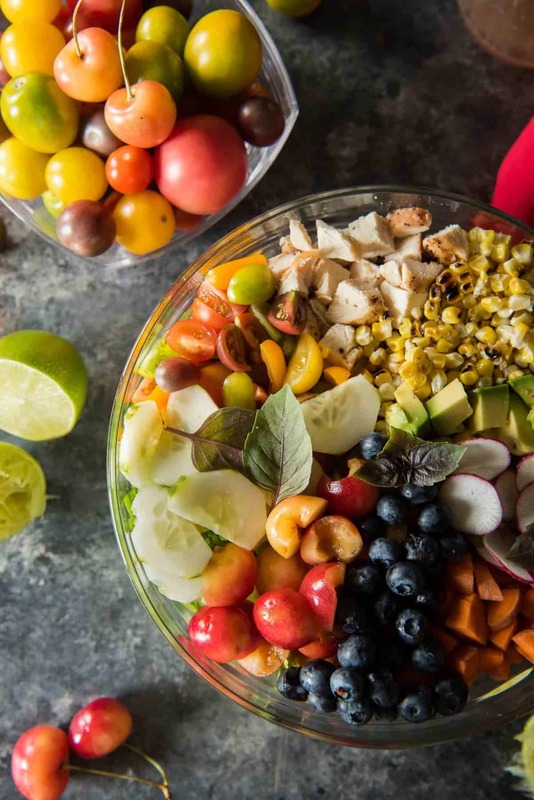 But for now, Summer Chopped Salad LOVE. 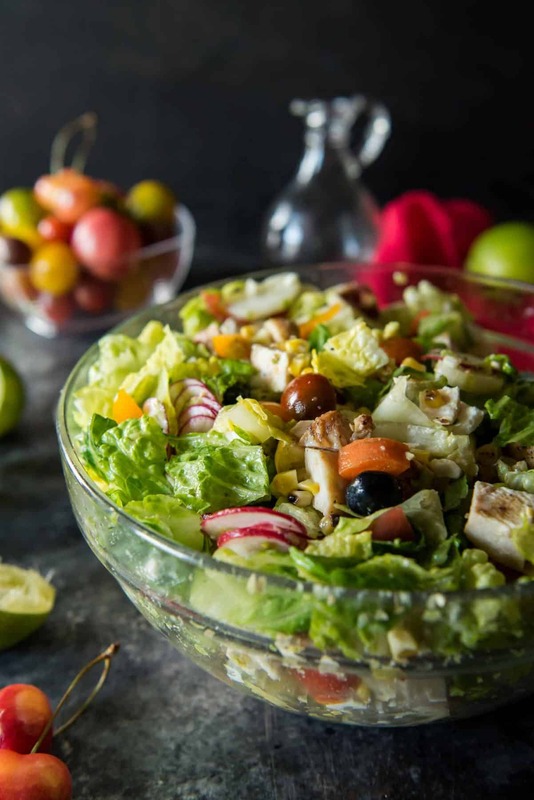 I’m not really a big salad fan unless it’s something like this – full of protein and crunch and some bursts of sweet. I’m a texture freak, so the more surprises I come across while eating a salad, the happier I am. When I make a salad for dinner, it’s usually big enough for 3 large or 4 smaller portions. I plate my own and then pass of the bowl to him. The man doesn’t even bother to transfer it from the salad bowl; he just pours his dressing on and goes to town. I guess there are worse things he could chow down on, right? 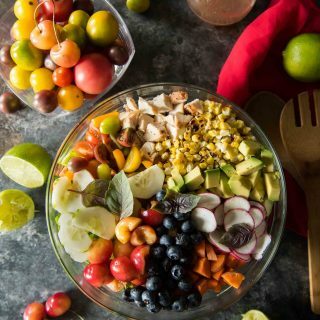 At least there’s plenty of healthy stuff in that bowl. There are days we come home from the gym and that’s exactly what he’s craving. As for me? I usually want 3 scoops of ice cream smothered in caramel sauce, but I make do. 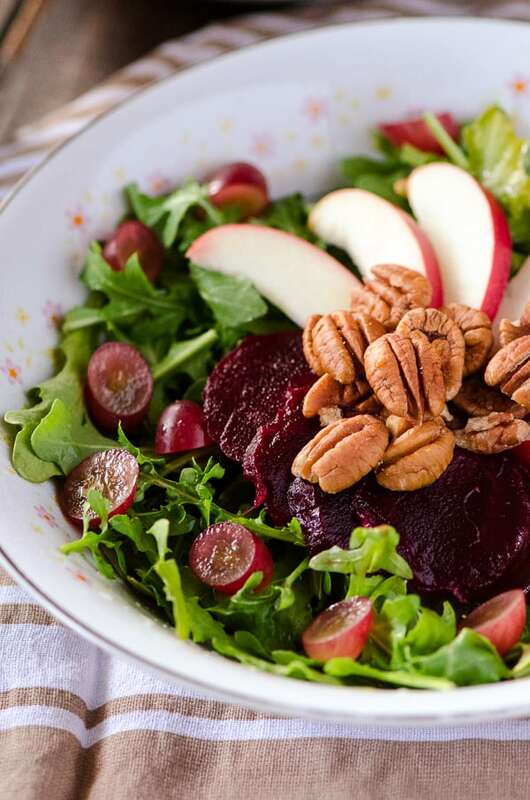 The simplicity of this salad is what makes it so delicious. Everything is chopped for easy eating (except the radishes – I can’t enjoy them unless I’ve slivered them to death on my mandolin.) 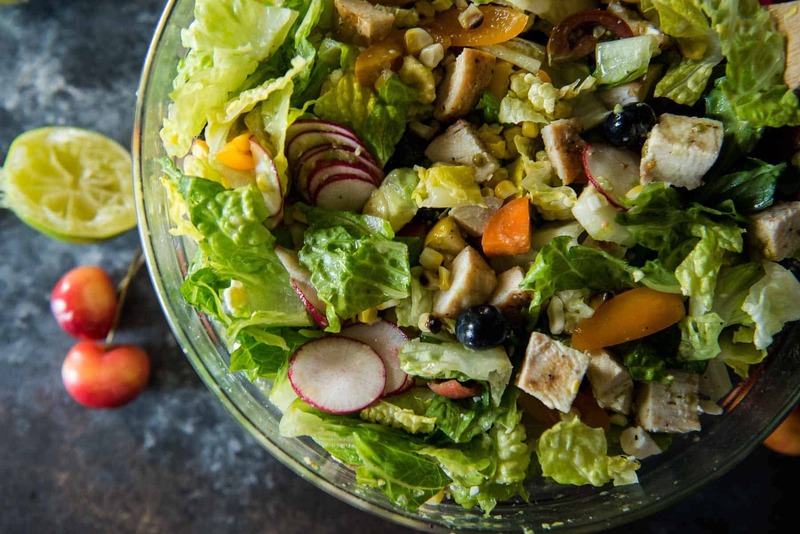 The flavors are straightforward, and the dressing is a tangy honey lime vinaigrette, punched up in flavor with a few sprinkles of crushed red pepper. I’m already thinking up fall versions of this monster salad. Arugula? Prosciutto? Pears? Maybe a maple bourbon vinaigrette?!? My veggie-holic Hubs will be pleased. 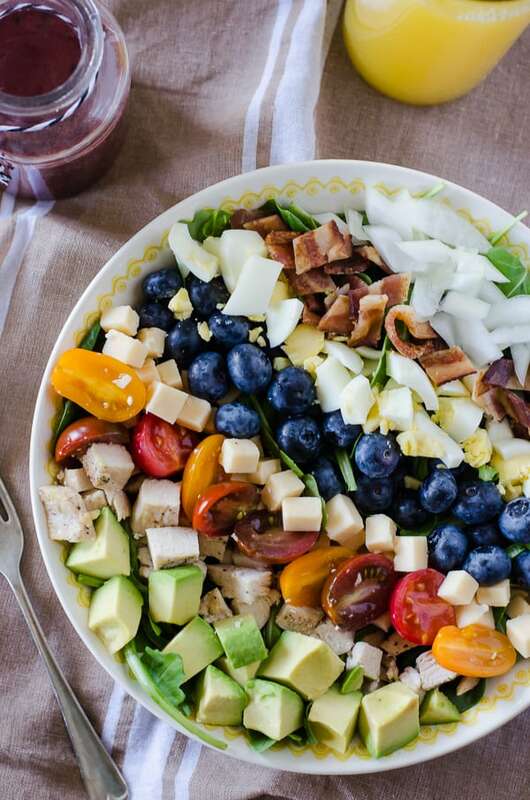 Summer lovin' in a salad! 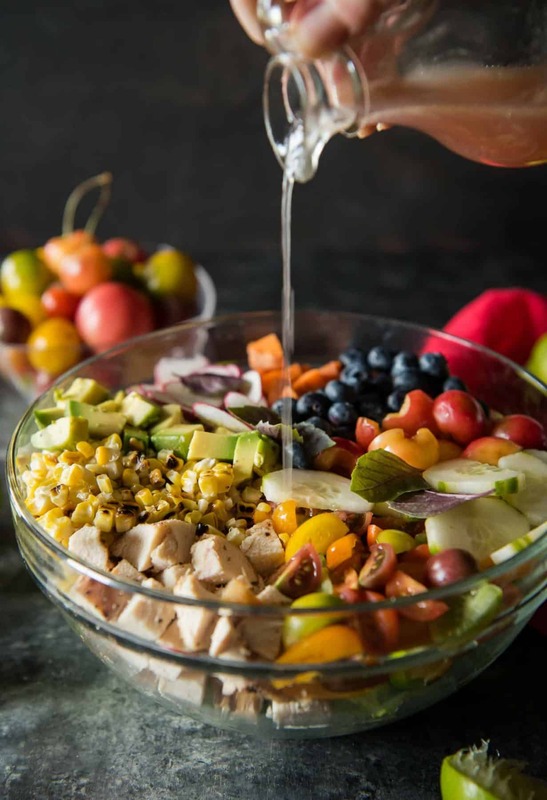 Grilled chicken, grilled corn, fresh cherries, blueberries, and avocado are tossed with standard salad fare and a tangy lime vinaigrette - creating a crunchy Summer Chopped Salad that's perfect for any meal! Season and grill your chicken and corn on the cob. Allow to cool enough to be handled, then cut the kernels off the corn cob and chop the chicken breasts. While chicken and corn are cooling, chop the rest of your vegetables. 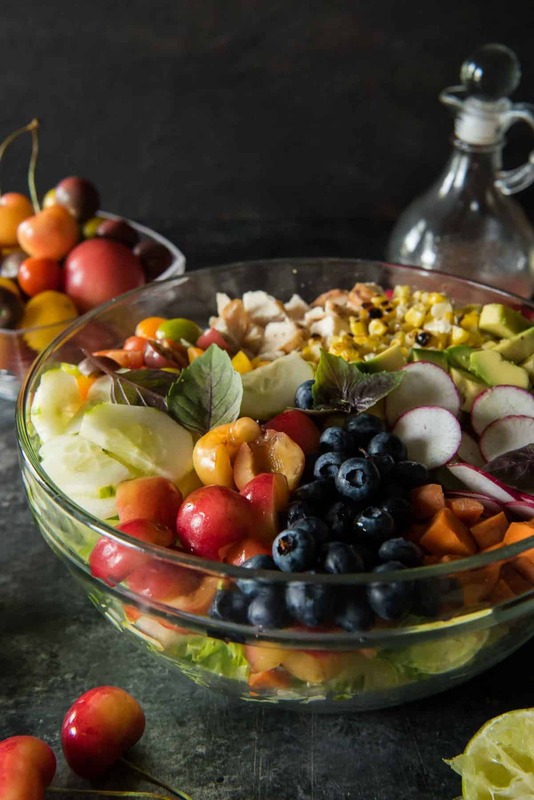 In a large salad bowl, mix chicken, all chopped fruit and vegetables, and basil together well. Sprinkle with salt and pepper to taste, then toss thoroughly. In a separate small bowl, whisk together lime juice, honey, oil, vinegar, and red pepper (if using.) Pour over salad, then toss again to coat. Sprinkle salad with feta cheese, then serve. 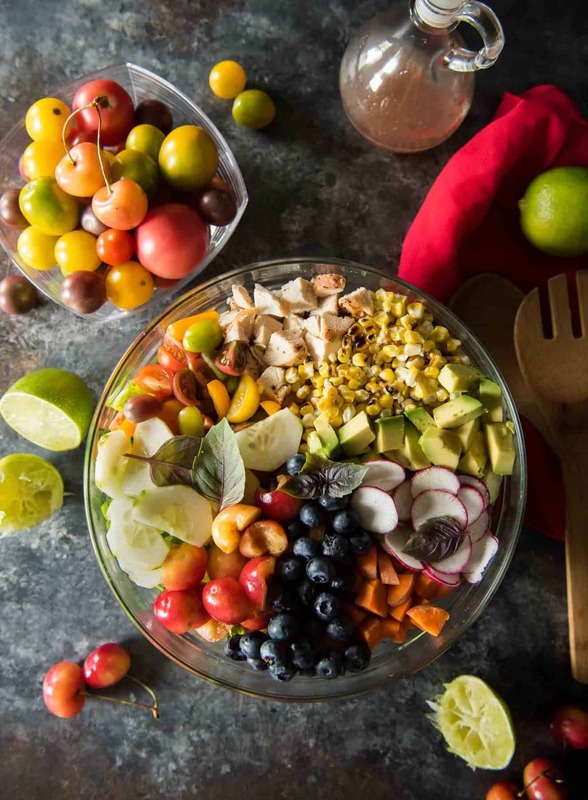 Looking for more great summer recipes? How about another salad? 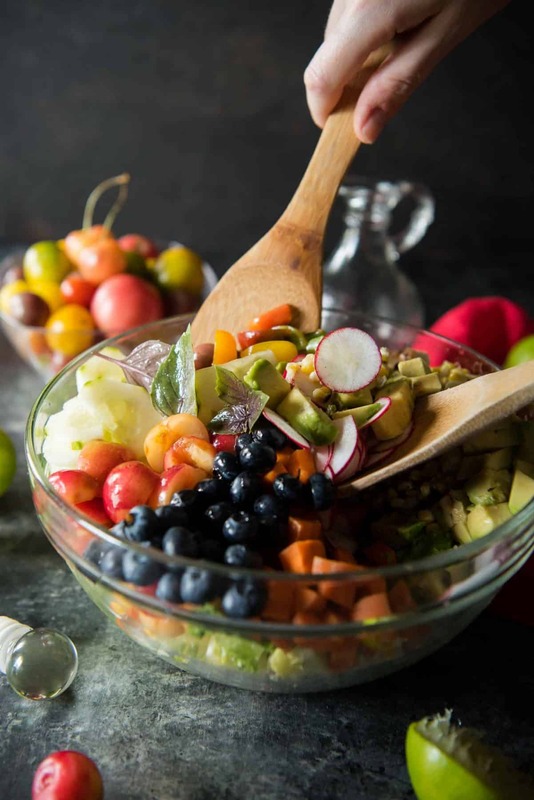 This salad is stunning ~ pinning and sharing!